Fly with VietJet and Win Amazing Prizes like Samsung Galaxy Smartphones! As part of VietJet’s commitment to provide passengers with an unforgettable experience on their trip to Vietnam, VietJet is now rewarding passengers with weekly prizes and nearly 1,000 free air tickets to be won over the next nine weeks. 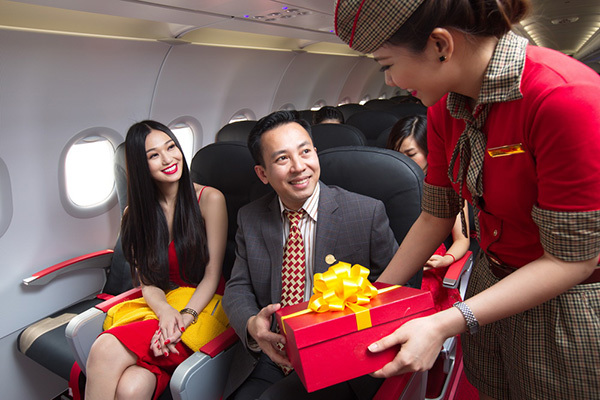 The promotion applies to passengers on all of VietJet’s domestic and international routes. To be eligible, passengers must produce their VietJet boarding passes or e-tickets when collecting the prizes. The list of prize winners, specified by corresponding flight and seat numbers, will be updated daily on VietJet’s website (http://www.vietjetair.com). VietJet has 24 local and international flight routes. In Vietnam, VietJet has successfully connected key economic regions such as: Ho Chi Minh City, Ha Noi, Hai Phong, Hue, Vinh, Da Nang, Nha Trang, Quy Nhon, Buon Ma Thuot, Da Lat, Phu Quoc. International flights include Singapore, Bangkok (Thailand), Seoul (Korea), and Kunming (China). VietJet is now operating 770 flights per week. Soon, it will expand international routes throughout Asia-Pacific. For further details, please visit http://www.vietjetair.com or the nearest authorised VietJet ticket outlet.